The Northern Treasures (Tib. བྱང་གཏེར་, chang ter; Wyl. byang gter) tradition centres around the terma revelations of Rigdzin Gödem Ngödrup Gyaltsen (1337-1409). The main seat and source of this tradition is the monastery of Tupten Dorje Drak, built in 1632 by the third Rigdzin Chenmo Ngak gi Wangpo. The reincarnations of Rigdzin Gödem, known as the Rigdzin Chenmos, are still the heads of the Changter tradition, as well as of Dorje Drak. At Dartsedo (Kanding, in Eastern Kham), there is a monastery called Do Dorje Drak, as one of the Rigdzin Chenmos was born in the family of Chagla Kings of Dartsedo. There are also a few monasteries in the Golok area, but most of the Changter monasteries are to be found in Western Tibet, the provinces of Tsang and Tö or Ngari, and the Himalayan areas of India, Nepal and Ladakh. 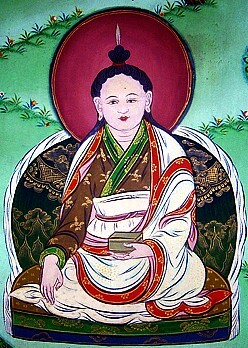 Among the most important of Rigdzin Gödem’s many terma revelations are the Kagyé Rangjung Rangshar and the Dzogpachenpo Kunzang Gongpa Zangthal. Extremely popular in the Nyingma world is the Le'u Dünma, the ‘Prayer in Seven Chapters’ to Guru Rinpoche. Many of the termas were discovered in Zangzang Lhadrak in Tsang, Western Tibet. It was because this area was considered to be “north” and also perhaps because it lay to the north of Samyé, that this tradition got its name.